In the beginning...the grace of the Lord Jesus be with God's people. Amen. The whole thing is filled with drama: disasters and dilemmas. It's hard to read the continued struggle of God's chosen people, but I think that is mostly because it continues to remind me how often I fail and choose the wrong things. That's what this month's reading is all about. If you've been reading through *most of the Bible in a year with us, you know that it the disasters never stop. What amazes me about reading through this dark drama God reveals throughout this time period is that he continues to provide glimpses of hope and plans of salvation. We definitely don't deserve a love like that. 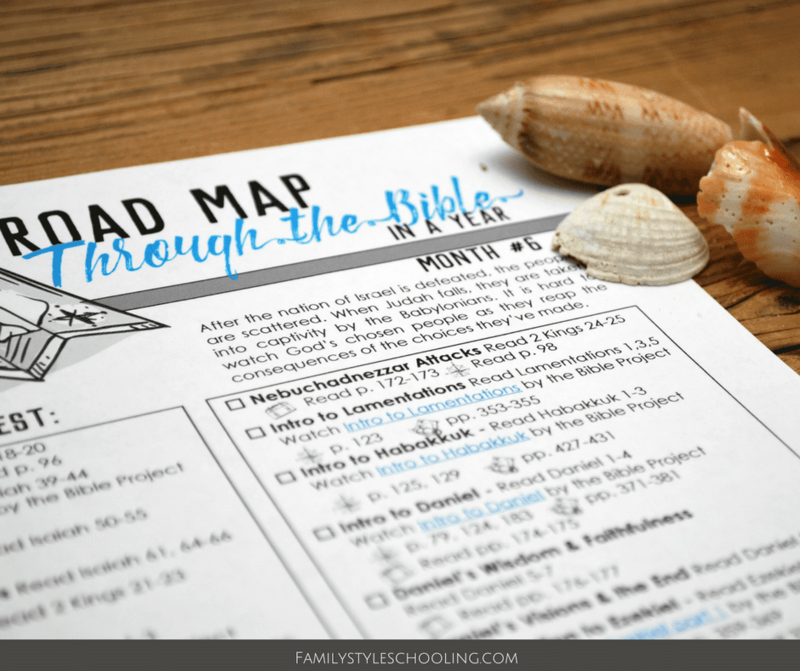 This might seem counter-intuitive, but on our last trip, we found that letting our family Bible reading fit more organically into our schedule allowed us to enjoy it more together. Since we were not all getting up at the same time, it didn't make sense to wake the family to read the Bible. I would surely have teens sleeping through chapters, and then I'd have to be the Bible reading police officer. Once that situation arises, nothing else is productive. By relaxing a bit, we found that there was a natural time in our day that we all enjoyed reading together - right after dinner. This blessed us all. Often we forget how fundamental vision really is. If you've been reading for five months, it can be easy to get worn out and think, maybe let's just take a break for a bit. And sometimes you really do need a break from the way you're doing something. However, if you started this journey because you wanted to give your kids the big picture of the Bible, a break might not be in line with your initial vision. Sit down and talk with your family about what you're doing and why you feel like it's important. They'll probably give you some great ideas on how to keep going. If they're on board, then you'll have a better time keeping the practice. They might even start reminding you! My kids have been working on writing their own stories this month. As they have been seeping in the elements of story, they have started to see the narrative of scripture in the same light. They're noticing the disasters that arise and the dilemmas that men face. When the scripture comes to life, it provides an alternative motivation to continue reading: they need to know what's going to happen next. If the goal is to make it through the Bible, the timeline isn't as important. If you need to slow down at times, then slow down. You might find you have more time throughout the summer, and you can read more at those times. Giving yourself grace will allow everyone to enjoy the reading for longer, and in the long run, you'll end up having the stamina to finish the course. 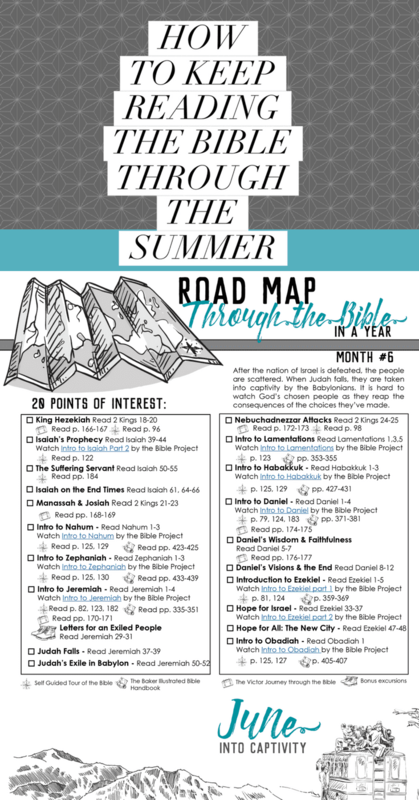 As you read through the twenty points of interest this month, pay attention to the disasters and dilemmas the Israelites faced as they distanced themselves from their relationship with their Lord. We have a lot to learn from them because we fall so easily into the same traps. Its only with intentional focus on the Lord alone that we can avoid these pitfalls, and that can only be accomplished by God's grace!